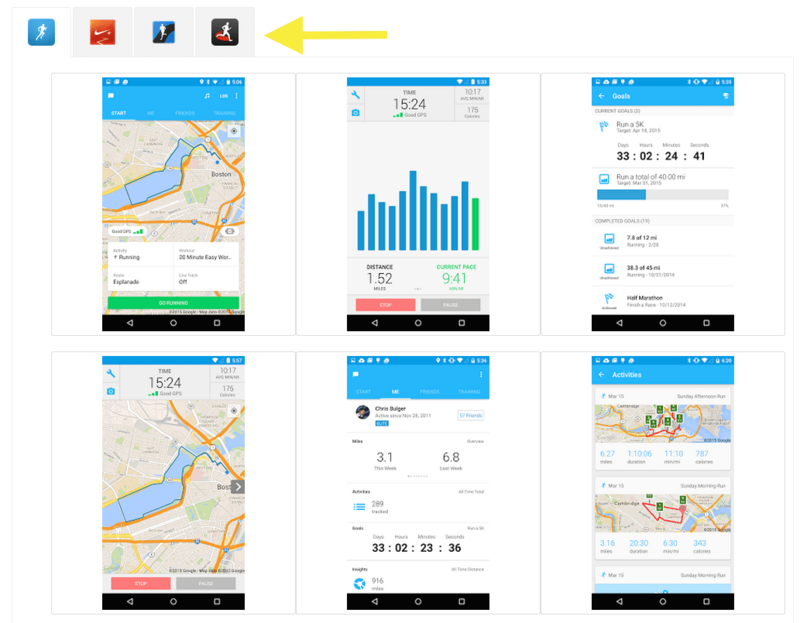 The whole AppTweak Team is happy to announce officially the arrival of a new Competitors Analysis Feature for Google Play apps. You’ll now be able to monitor your ASO with your competitors, on the same page! Gain valuable insights on your competitors and find ways to stand out. Find out details and explanations right here. Recently, we’ve observed a high increase in our Google Play users. For this reason, we’ve decided to speed up our improvements on the Google Play section of our App Store Optimization platform. About 2 months ago, we presented you our new competitors analysis feature but it was only available for iOS apps. Well, good news for Google Play developers and marketers, they are now able to benefit from this feature for their apps as well. Competitors monitoring is absolutely essential in any app marketing strategy. Not only this can help you find a positioning before your app launch, this can also help you adjust your strategy and make your app stand out from the crowd. By knowing the market you’re dealing with and by following its trends, you will get a better understanding of what users are looking for and therefore you will be able to respond to their needs accordingly. You need to be aware of everything that your competitors are doing; whether it is inside their apps or regarding their app marketing and ASO strategies. It is impossible to be step ahead of your competitors if you don’t know how their strengths and weaknesses. This is the reason why we paid a lot of attention to facilitate your work here. We therefore came up with this unique competitive intelligence feature. On the ASO Report of your app, you can now add and track one competitor (or more, according to your subscription). 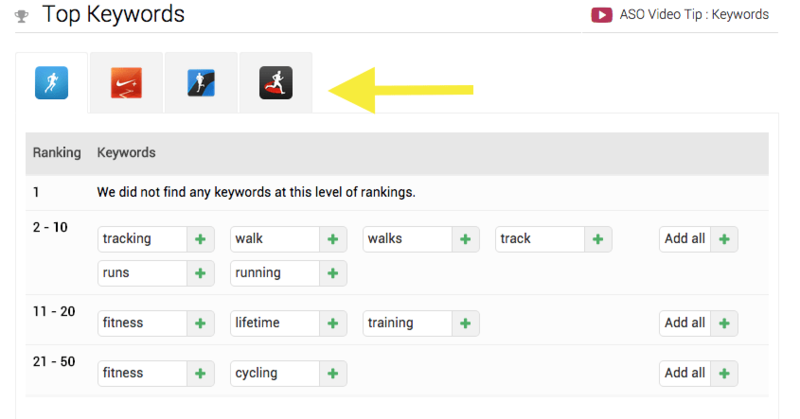 In other words, you’re now able to see your competitors’ ASO factors (app icon, app name, description, keywords, etc.) and to compare them with yours without switching from one navigation window to another. It is extremely simple to add a competitor to your report. #1: First, go on your ASO report. #2: Then, click on “Add a competitor” button on the top-right of your report. 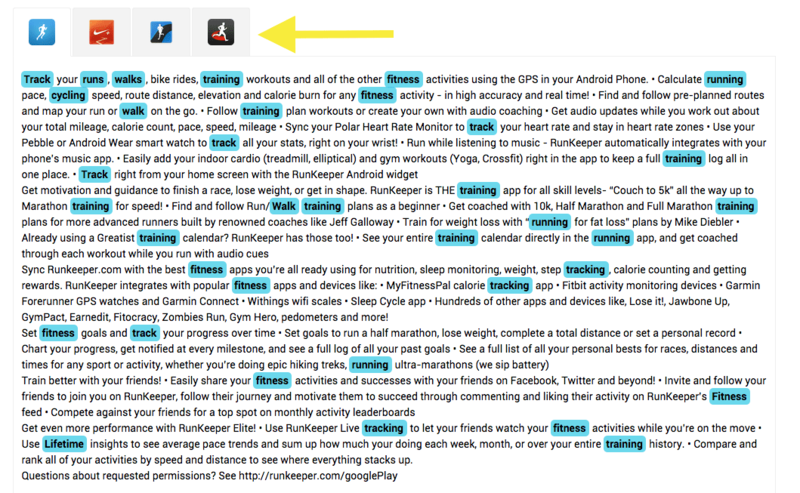 #3: Type in the name of the competitor you want to analyze. #4: Select it from the list. #5: Click on “Add a competitor”. You’re done! Your added competitors are now on the top-right of your report. See below an example with Runkeeper app. All you need to do is to click on your competitors’ icon (next to the yellow arrow on the pictures above) and you will be able to see their ASO work on every element. Very easy! Moreover, you can also track your competitors’ trends and rankings in time and compare them to yours, on the same graph. You can view the ranking history for “all” categories in the Store as well as for the category the app is located in. It goes back in time since the last 30 days, but we’re working on extending this period to 3 months (coming soon…). This new competitive intelligence feature will hopefully facilitate your competition analysis and let you gain valuable insights to improve your app rankings and downloads. As usual, we really hope that this new release will be useful to you and your ASO work. We’re already working on a next one, so stay tuned! We’d love to have your impressions on our platform, so feel free to reach out and let us know your impressions. Enjoy our new release and don’t forget that competition monitoring is absolutely essential in any app marketing strategy! So what do you think of this new release? Please share this post if you think that this feature will help app developers and marketers to improve their apps.